Hi everyone I'm Jack Red, I get to talk about one of my absolute favorite Sega franchises. Golden Axe are some of the best among hack & slash beat em up style games you will ever play. I played all three Genesis games as well as Golden Axe Warrior on Sega Master System. I will be reviewing all four of them in this blog entry. As a kid I really enjoyed playing this game. Golden Axe is an excellent Genesis port. One of the very best among very early Genesis games. The music is one of the very best you will ever heard on an Sega console. Golden Axe involves a dwarf, barbarian and amazon warriors joined forces against Death Adder. Keep in mind some versions are based on Genesis port that does add levels also changing the main antagonist. Yes Death Adder is still in the game but technically he has been split up into three characters. You could do the easiest difficulty playing almost half the game to face Death Adder Jr. final boss fight. Beyond defeating Death Adder you have to work your way to his boss Death Bringer. This guy is even tougher than Death Adder in the arcade version I'm not kidding. Each character has a different magic type as well as amount they can hold. Dwarf having the lowest while Amazon has the highest magic. They also changed not counting bonus portions as levels like originally in the arcade version. This is a great game to play with another person. The same guy that made this also created Altered Beast. Yeah I do highly recommend Golden Axe over Altered Beast. Golden Axe is a must play Genesis classic. I played this as a hidden game on Sonic's Ultimate Genesis Collection. This is virtually a classic Zelda style game. It is so similar that there isn't a lot to separate them I'm not kidding. Almost everything you can do is also possible in The Legend of Zelda. This is as close to Sega ever got to ripping them off. There also exists a Game Gear spin off game following Ax Battler aka the barbarian. Which is more of a Zelda 2 clone than anything else. The music is once again solid for a Golden Axe game. You could even say this was Sega's Zelda I know a pretty bold statement. Golden Axe Warrior should feel familiar to those playing Zelda games of that era. I do highly recommend find a guide as well as maps. Trust me you will quickly get loss fast in this game. The map itself is one of the biggest in size for a SMS game. You do find some familiar enemies including bosses. This game would be one of the finest among Sega Master System. 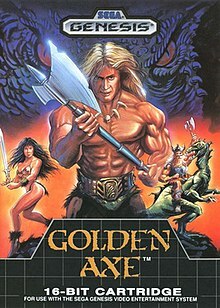 In fact it isn't just a must play title, it also a rather unique experience for a Golden Axe game. I have stated a few times this game is mixed received. The biggest criticism being it is too similar to the original Golden Axe. I do agree some parts of it are similar but it also made some clever changes. For example instead of simply attacking thieves. You have to deal with mages that will fight back. Unlike most Golden Axe games, you can decide how much magic you will be using. You also can change the direction of throwing your enemies at will. Which is helpful in some later portions of the game. I will say the final boss to me was a huge disappointment. I was expecting a worthy final boss to push me. I ended up fighting one of the cheapest final bosses in beat em ups ever. This guy will do his best to keep his distance. He keeps creating more skeletons to prevent you having time of attacking him. Most of his attacks will do a lot of damage to you. In fact I had to rely on a similar trick some people would use on Death Adder & Death Bringer by default. This guy is fighting dirty to the point it simply isn't fun. For me this is my least favorite Golden Axe game among the main series. I wouldn't say it was the most disappointing Golden Axe game I ever played. No that award goes to 3D remake of Golden Axe that's part of Sega Ages or Sega Classics Collection on PS2. Golden Axe III greatly changed things up. Sadly none of the original characters are playable. Although the dwarf now dead is still present. I would say there is more of a variety among playable characters. Chronos is hands down the best character. I felt he is the most well around out of everyone. In it's versus mode you select a character. Then you must defeat all the playable characters. Oh wait they added that bird man aka the king as a playable character in that mode. You even have to defeat yourself too. This is very similar to games like King of the Monsters despite doing the process twice. Golden Axe III did make the AI smarter but also cheaper. Regularly I would say the skeletons are the cheapest enemies. In this game every enemies you will be facing is incredibly cheap. But the knights are surprisingly much easier than the previous two Genesis games. There is multiple paths that does affect the difficulty. They were really strict on how to get the true ending which I still never gotten. Overall I felt like they were trying too hard to make this game stand out.